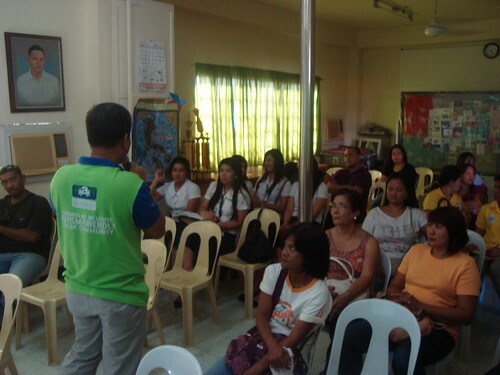 Autism Society Philippines National conducted a lecture on the UNCRC to the 35 parents, siblings and teachers from the Inocencio Magtoto Memorial Foundation and five students from Assumption Pampanga last November 27, through Ms. Joy Ofrecia, Chapter President of ASP City of San Fernando Pampanga Chapter. The said lecture is part of ASP’s Project on Teaching Children with Disabilities using the Digital Talking Books. Mr Ranil Sorongon, ASP Executive Director discussed the rights of the children and showed the audience the research facts and statistics. After the lecture, it was my turn to teach the 15 teachers of the Magtoto Foundation on how to use and navigate the Digital Talking Books. I first introduced to them the Amis program that will be use for them to be able to read the learning stories. I showed them the 6 learning stories, 3 English and 3 Tagalog. The teachers were all surprised when they learned that the one who illustrated the book was a person with asperger syndrome. Each of the teachers gave their suggestions and comments about the books. The Executive Director, Ms Clarita H. Magtoto, was so happy informing Mr. Sorongon of how beautiful the project is and that they are also willing to be one of our partners for the project. This article is a contribution from Catherine Espenilla Genovia, ASP Project Officer.